Here are Sunna’s five favourite Icelandic albums. Although ‘IV’ doesn’t contain my two favourite Hjálmar songs, “Ég vil fá mér kærustu” and “Leiðin okkar allra,” it’s my favourite album. When I was a teenager my best friend gave it to me and I couldn’t stop listening to it. I lived in the suburbs so I often borrowed my parents’ car to go and visit my friends that lived downtown. I quickly learned that it was important for me to have my own music in the car since my mother mostly listened to Eros Ramazzotti. When I joined Bloodgroup, I didn’t know the band’s members or songs. We had a tour coming up so we had to practise a lot and at one practise Hallur, a bandmate, handed me a CD from one of his previous bands. Since I was still borrowing my parents’ car I listened to it on the way home from practice that night. It was a pleasant surprise to discover that Hallur had another side to him. I think that’s why we became such good friends. I like both sides though, just to be clear. It’s probably a cliché to list Björk as one of my Top 5 but I don’t care. It’s a great album and even though most of her music is, I’ve listened to this one the most. I read an interview the other day where she talked about being a woman in the music business. I’ve had my share of that stupid reality, but not nearly as much as her. The other thing we share is being Icelandic musicians and the most frequent question we get is: “How has the Icelandic nature influenced your music?” I feel ‘Homogenic’ wraps that up pretty accurately. If you don’t speak Icelandic I suggest you learn it right now, if only to understand Tvíhöfði. It’s really a comedy, rather than music, but itwas released on a CD so I’m going to call it music at its best. I can’t count the times my sister and I have quoted Tvíhöfði throughout the years. ‘Til hamingju’ is their most played album but ’Sleikir hamstur’ has my favourite cover. Fun fact: The comedy duo includes Jón Gnarr, the former mayor of Reykjavík. I would say this one is a must-have if you are an old soul like myself. It was released in 1964 and is a treasure. 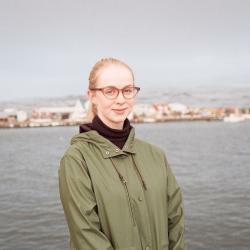 Also: songs that are not on this album but are worth listening to are “Jarðarfaradagur,” “Brúðarskórnir” and “Eins og Þá,” which is the name of another album by Savanna Tríóið. On that cover my dad, a member of the band, has a nice curly mullet (sorry dad). There’s a bunch of musicians I would have wanted to include such as Ellý Vilhjálms, Megas and Grýlurnar. The album I’m about to listen to next however is ‘Black Lights’ by Samaris, highly recommended.